We have attained specialization in manufacturing and supplying a qualitative range of Tile & Grouts, which includes Tile Fixing Adhesive and Mr Home Guard Grout. These products are made using high quality raw material and latest machinery in compliance with the set industry norms & standards. 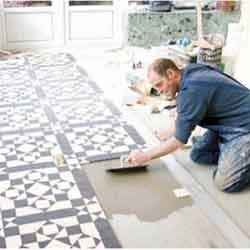 Our products are widely used fixing tiles on the floors and walls in residential as well as commercial buildings. We offer these products to the customers as per their demands at industry leading prices. MR. Home Guard - Tilefixo is a single component, ready to use, tile fixing adhesive. It is specially formulated for greater adhesion in fixing of ceramic, mosaic, quarry, terrazzo and cement tiles to masonry and cementitious substrates as well as walls. We are looking queries from Pune, Mumbai. Normally, the material used for fixing tiles is neat cement paste, which loses its workable consistency after about 30 minutes and more water has to be added. This results in decreased bond strength. The shrinkage that takes place in cement, on drying, is a potential hazard, particularly on a vertical surface. In fact, these are the reasons for tiles de-bonding and falling off. To overcome the inadequacies of traditional bedding and fixing materials, MR. Home Guard - Tilefixo has been developed & specially designed for such applications. It increases the adhesion and durability. MR. Home Guard – Grout is a specially formulated cementitious grout which has excellent shrink resistance and free flow properties. It is cement based ready to use non shrink, non metallic compound, specially blended of Portland cement, highly graded silica sand, plasticizing and expanding agent, it is non-oxidizing and is free of chlorides. The high strength cementitious grout has unique formulation which doesn't cause corrosion of machine parts, bolts etc, in contact with steel. Exposed surfaces of MR. Home Guard - Grout should be cured like concrete in order to avoid premature evaporation of the water. Start curing as soon as the grout reaches its touch hard state. Curing up to minimum of 7 day is a must. We are looking queries from Pune, Mumbai.